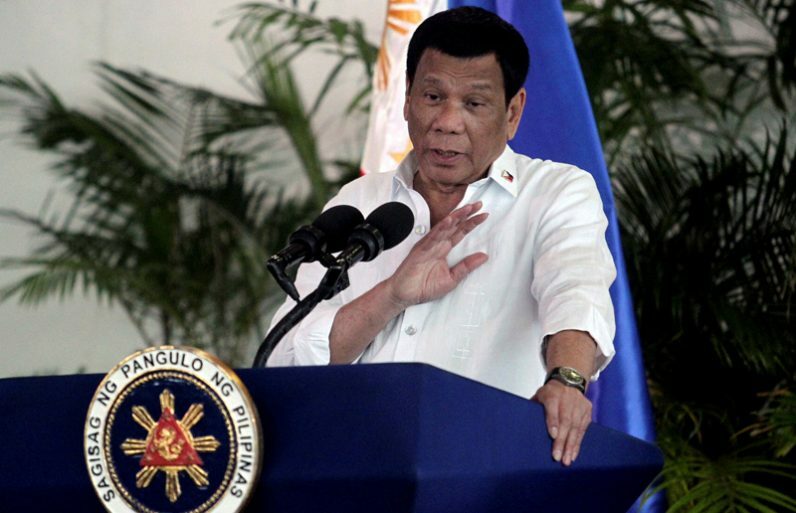 MANILA, Philippines (CNS) — Members of the Philippine clergy and human rights groups responded to President Rodrigo Duterte after he threatened to arrest all of his critics. At a gathering of prosecutors April 4, the president threatened to declare a “revolutionary war” if his critics “push me to my limit,” reported ucanews.com. “I will arrest all of you. I will put you together with the criminals, rebels and drug lords,” he told the annual conference of the country’s prosecutors. “Poor people already live in fear,” said the bishop of the diocese where 14 farmers, accused by the police of being communist rebels, were gunned down March 30. “We pray (Duterte) won’t do it,” said Bishop Alminaza, adding that a crackdown will only fuel more unrest. Father Wilfredo Dulay of the Missionary Disciples of Jesus said the “noose is tightening” around Duterte, referring to a series of videos alleging that drug money has been funneled into bank accounts owned by Duterte’s children. The Dutertes have denied the allegations. Paolo Duterte, the president’s son and a former vice mayor of Davao City, indicated he knew the identity of the accuser. “Today’s challenge is for all of us to band together to oppose this threat of dictatorship,” he said. “He is feeling the pressure. Endless criticism about Chinese incursions, the killing of drug addicts and farmers, and more recently, the alleged involvement of his family in drug syndicates can push him to the edge,” said the priest. “They have used up their credible excuses. This is an expression of a desperate man,” he added.